#234. Silver Lake, California. 10 x 14, oil on canvas. "Gilbert Munger 1877" lower left. This painting was bought by a NJ antiques dealer at a Lincoln & Mayflower estate auction in NJ in September 2004. It then sold for $24,000 + 20% at the Shannon's Fine Arts (Milford, CT) auction of 26 October 2006, lot 137. 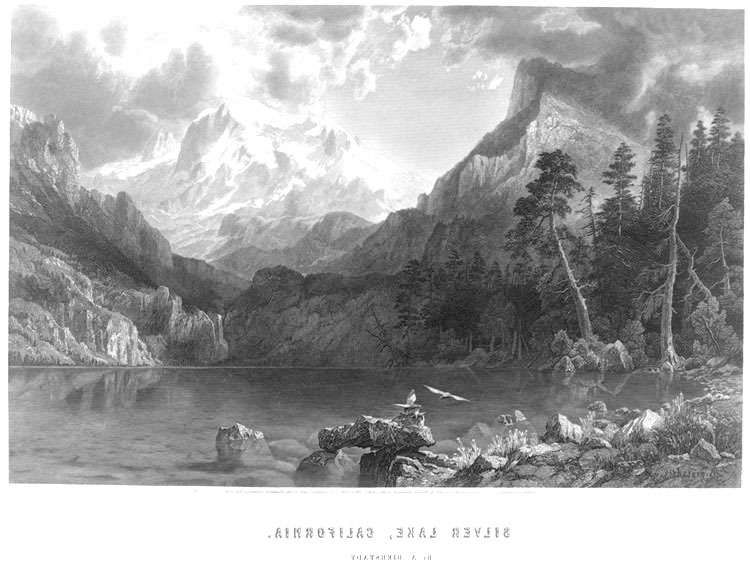 The painting is reminiscent of the 1867 etching Silver Lake, California that reproduces an 1864 painting by Albert Bierstadt. That etching is shown at the right (click on the image to see a larger version), reversed to correct for a possible reversal when the engraver transferred the image to the plate. The overall structure of both pictures is similar and many of the details match well, e.g., the bent tree in the right foreground, the rock shapes near the water fall. There are several Silver Lakes in California, but so far none of them seem to match the pictures very well. 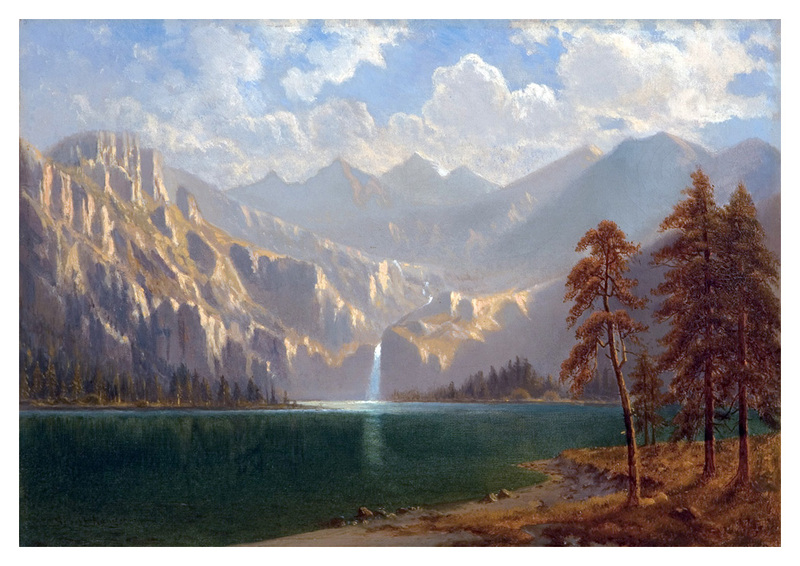 On the other hand, Anderson & Ferber mention in Art & Enterprise at page 181 on the entry for 31 October 1864 that Bierstadt is in New Bedford and painting Silver Lake, "a view of a little lake in the Sierra Nevada range, California." So placing the lake in Califoirnia seems a good bet. 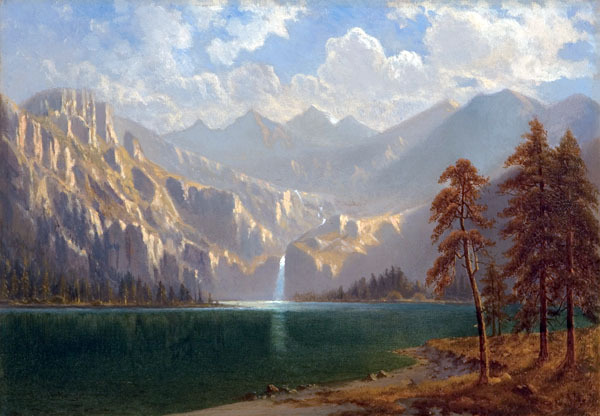 It is possible that Bierstadt made up many of the elements of his scene, as he often did. But Munger was not in the habit of inventing landscape in his paintings. The 1877 date means that Munger produced this painting after he had moved to London. Perhaps a client brought him a copy of the Bierstadt etching and asked Munger to produce a similar painting, although this would be unusual behavior for Munger. More likely Munger visited the place too. Hopefully time will reveal the true history of this painting. Painting image provided by Shannons in an email.